The FilterPod can be vented either Non-Electrically or Eco-Electrically, without the need for the Filterpod vent pipe. 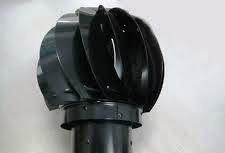 FilterPod is designed to use non electric venting (aeration). Aeration is the key to treating wastewater as the removal of pollutants is driven by aerobic organisms. The presence of sufficient oxygen is the fundamental difference between a sewage treatment plant and a septic tank. Passively (non electric) with air inlet and outlet vents. Electrically via the use of a Fan Box . FilterPod achieves passive, non electric, aeration by having a low level air inlet vent on the tank and a high level air outlet vent. Non-electrical venting of the FilterPod Sewage Treatment Systems is site specific, which is why we emphasise the need for recommended installers to install the plant. However, there are some rules that must always be obeyed in order that the FilterPod receives enough air to oxygenate the media correctly. Both the FilterPod Filter and the Settlement or Septic Tank must be vented independently. They share a common Air Inlet but a separate Air Outlet Vent with a wind fan, must be provided for each tank, just as every fireplace must have its own chimney in order for the draw to be sufficient. As short a lateral distance between the respective tank and vertical chimney as possible. The underground section of the Air Outlet Vent connecting the respective tank to the vertical section of the Air Outlet Vent (chimney) must slope upwards, all the way, towards the chimney. section of the Air Outlet Vents must have no more than one directional bend. If a directional bend is required it must be a sweeping bend, not a 90 degree bend. The wind fans MUST be situated in clear, open air space, not surrounded by trees, tall structures, at the bottom of a slope, etc. as this will stop the air currents and may even cause down-draughts. The FilterPod cannot work unless the venting is correct. Please use a trained installer as venting is site specific. The minimum vertical difference between the top of the Air Inlet and the top of the Air Outlets is 5 metres with a wind fan fitted. The wind fans come as part of the package. The height above is a MINIMUM difference. Your site may require higher air outlet pipes, depending on the site restrictions to airflow. In order that the airflow is enough, it must be checked on a still day with an Anomometer. The ventilation pipework must have an internal diameter of no less than 100mm. The Air Outlet Vent must be as close to the respective tank as possible and no further than 10m away. Where the Soil Vent Pipe on the house is within 10m of the Settlement Tank then this will act as its Air Outlet Vent and no additional pipe work is required for the Settlement Tank. However, a wind fan must be fitted to it. No air admittance valves or other obstructions to air flow should be fitted to any part of the air ventilation system. The top of the wind fans must be open to the wind and air currents. They must not be sited in the vicinity of trees, bushes, at the bottom of a slope or hill or other structures that may act as a wind break and protect the top of the Air Outlet Vents from wind and air currents. If the Air Outlet Vents are run up walls, posts or other structures then the wind fan must clear the top of the support structure by a minimum of 300mm. Examples of incorrect venting - why you need TRAINED, competent FilterPod installers! This vent from the FilterPod is not high enough. It is around 1.4M tall. There is no possibility of enough air being drawn through the plant. It does not have a wind fan. It is also sited underneath a tree. This vent pipe from the FilterPod has its opening suffocated by foliage and branches. The draw will be severely restricted. The pole is also blocking the wind when it comes from the direction of the pole. The vent pipe must be in open airspace at least 300mm. clear of the top of the pole. 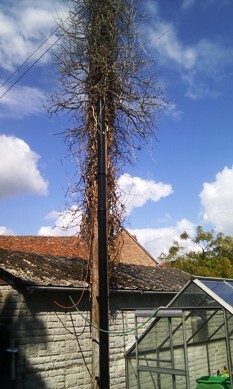 No wind fan has been fitted as, because of the restriction caused by the branches, it could not even turn. This house is using the existing Soil Vent Pipe as the vent for the settlement tank. Unfortunately, it cannot work as the vent air flow is blocked by the wall itself. No wind fan. 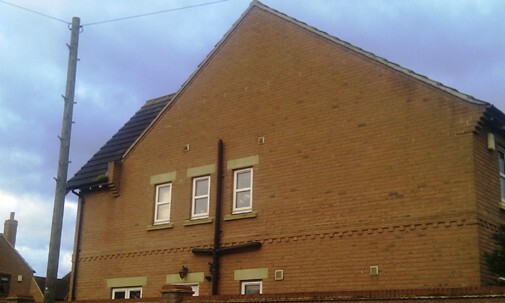 The vent pipe should be extended to clear the roof line and a wind fan fitted. 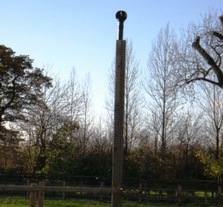 This vent pipe is 5 metres tall and the top is positioned well clear of the support pole. 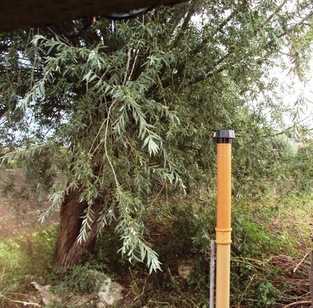 It is 60 metres away from taller trees and also has a wind fan fitted to help with the air flow on calm days. The wind fan has been fitted. This plant is achieving a superb effluent quality in single figures and the owners are delighted with the system. If high vent pipes will cause a visual problem, or if they are not feasible due to close proximity of trees, etc. then click on Eco-Electric Venting.